You know that sign you more than likely have in your warehouse, “X Days Accident Free”? It’s important that your workers follow safety rules and guidelines, of course, but did you know that the types of safety accessories you have in your warehouse, distribution center, storeroom, machine shop floor, etc. 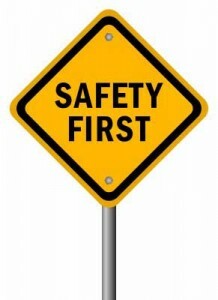 can also help your company grow the number of accident free days tremendously. You also may be required by OSHA regulations to have/use these accessories in your workplace. Dock Lights: Obviously, using dock lights judiciously provide better visibility for your employees and any visitors to your business. Many warehouses and distribution centers work on a 24-hour schedule. With workers loading and unloading trucks on docks all day and all night, the brighter you can make it with an appropriate number of dock lights, the better. Forklift traffic signs, high voltage signs, no parking, no entry, emergency exit, watch your step, tripping hazard, pedestrian walkway, heavy equipment crossing, and more – all can go quite a long way to keeping workers and visitors safe. Trailer Securing Devices: you’ll want to make sure any trailer being loaded or unloaded won’t move. So it’s a great idea to invest in devices to ensure that a) your trailer stays securely in place and b) any cargo being moved out or in also stays put. Overhead Door Track Guards: If it happens once, it will happen dozens of times – your overhead door tracks are hit and damaged by moving vehicles. Protect your door tracks with track guards. Made of plate steel, the track guards we provide are well designed to withstand impact. Guard Rails to Protect In-plant Equipment: Industrial-strength guard rails will protect your workers as well as your plant’s equipment. Employee injuries are reduced, as is damage to trucks and machinery, meaning your worker’s compensation and equipment repair costs are reduced.